Even though Spirit Airlines ditched its loudmouthed, hate-embracing CEO Ben Baldanza, and pledged to improve performance, the discount carrier has once again come in dead last in a national customer satisfaction survey. The American Customer Satisfaction Index has released its annual report on air travel [PDF] and overall things are largely unchanged from last year’s, with the same airlines winning and losing with customers. JetBlue saw only a very modest increase — going from an 80 to an 82 — but remains at the top of the heap for satisfaction overall. However, Southwest, which last year tied for first, is only barely behind, scoring 80. At the other end, Spirit is once again bringing up the rear, coming in with a 61. That’s about on par with its last-place finish from 2016, where it scored a 62. And both of those, sad as they are, mark a significant improvement from the 54 it scored in 2015. The airline seeing the greatest improvement year-over-year is Allegiant, which scooted up from a 65 to a 71, an improvement of 9%. 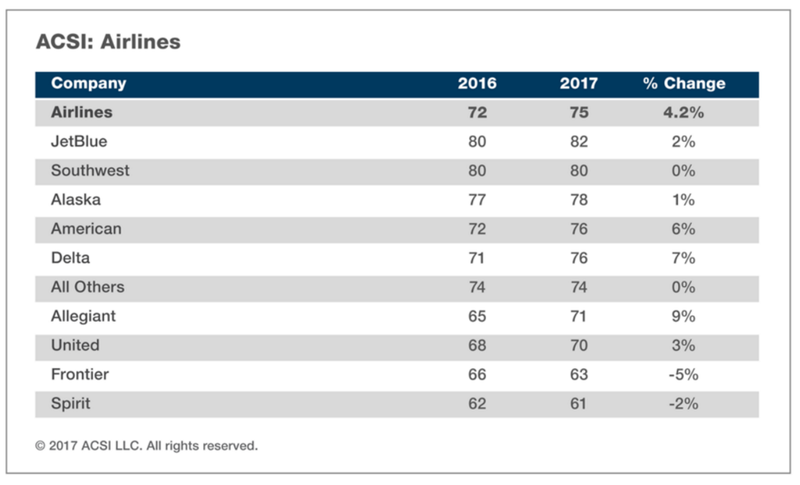 The overall scores for airlines from the 2017 American Customer Satisfaction Index survey. The report also notes that while United is the lowest performer of all the legacy carriers — coming in at 70, and the third lowest score with only Frontier and Spirit behind it — the survey took place before the recent passenger-dragging debacle, and so no recent bad publicity contributed to its rating. The airline had a rough couple of years in the index before 2017, too, dropping all the way to a 60 in the 2015 report before managing to bounce backto a 68 last year. The good news, such as it is, is that no single airline covered in the survey scored lower than a 60 — so if customer satisfaction were a high school class, at least they all clear the D- threshold. But that’s still not exactly great, and the industry overall, with its 74, lands squarely in “C” territory at best. Overall, satisfaction with on-time arrivals is up, hitting a new high-water mark of 81. Customers are also generally satisfied with how easy it is to make a reservation and check in, how generally friendly and helpful the flight crew is, how user-friendly airline websites are, and even baggage handling. All of those manage scores of 80-82, this year, indicating travelers are more-or-less happy. However, surprising perhaps nobody, the lowest marks go to “seat comfort.” Satisfaction with having enough space for your actual body increased all the way to 71, from last year’s 67, but still sits far behind pretty much every other aspect of air travel the survey measures. The report also compares customer satisfaction with internet travel booking sites, but it’s worth noting that thanks to years of mergers and buyouts, its full list essentially boils down to Expedia, Expedia, Expedia, Priceline, and “others” — and that all of them fall within a three-point range. You can read the full report, which also includes satisfaction rankings for hotel chains, here.